Make up your dough, leave to rise, then oil a baking sheet and press the focaccia into a flat oval or rectangle. 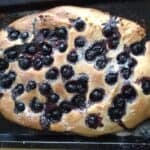 Drizzle with sunflower oil, drop on the blackcurrants and press them down lightly. Bake for about 25 minutes at 200 degrees or until lightly brown. Remove from the oven and sprinkle over a couple of spoonfuls of caster sugar. I used this BBC recipe as the basis. My amendments were to use sunflower oil in the dough and replace the fine sea salt scattered on top with sugar scattered on top after baking. I made half the quantity here.